There is nothing new in the fact that the coast of the Campania region (Italy) are , as far as holidays are concerned, one of the best stages for sailing cruise. Traffic is certainly the heaviest, but by choosing accurately dates and times and avoiding week ends, one can enjoy one of the world's best scenery. For our cruise, we shall select only three islands leaving the discovery of the many coastal jewels to a tour by car. The closest to the main land, and the less known to sailing wanderer, is Procida island which by no means is less attractive then the others, better known, islands. Procida lies in front of Miseno Cape and the channel dividing the island from the mainland and bearing the same Capès name is difficult to negotiate due to the presence of many reefs across it. The biggest of these latter dangers to navigation, named as Torrione reef, is marked by a lighted spar. Marina di Procida, the main town, lies on the northern side of the island and its port is made of a dock , this latter also acting as breakwater. Extreme care should be exercise when entering the harbor due to the heavy ferry traffic; a marina under construction and almost finished (250 berths are already available) offer possibilities of docking. Completely built with yellow tuff rock and with orange trees scattered everywhere, Procida convey the unspoiled glamour of the old sea towns. The housing conglomerate called the "Palazzata", resultant of a very liberal and randomly executed construction minus a proper building plan, has produced an architectural ensemble typical of the location and not found elsewhere. Inland, in the hart of a boroughs called Terra Murata, a huge parade ground overlooks the Saint Michael abbey rebuilt during the Spanish rule after being destroyed by the Saracens. Circumnavigating Procida, shelter can be found at the Vivara islet connected to the shore by an artificial isthmus. The islet which seats a natural park, is covered by a thick vegetation and a lookout tower stands at its top. The cove formed by the two islands make for an excellent anchorage; alternatively one can call at Chiaolella harbor where boats with 15 meters LOA can be taken in. 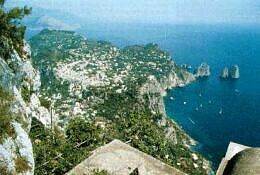 On Ischia island much has been said and written. With an area equal to 47 square kilometers, is the biggest of the Gulf's islands offering many interesting aspects. Inhabited since the pre-roman times, the island was famous for its clay used to carve vases and useful containers and in the third century B.C. suffered of volcanic eruption which left a salt lake in place of the volcano mouth. The lake was to remain separated from the sea until the last century when king Ferdinand the Second ordered to dig an opening obtaining a natural harbor that was christened by the royal yacht "Delfino" escorting more than one hundred boats and giving to Ischia the safest port one can seek. There is room for 200 berths with LOA up to 30 meters with full and efficient services. Above all, the call at Ischia is worth for a visit to the renown thermal baths, last remainder of the island's volcanic origin, and where with a water temperature of 65 degrees C one is washed as well as properly purified and healthily refitted. Another anchorage is found at the Carta Romana road, close to the Aragonese castle built by Gerone of Syracuse an lava islet and overhanging the sea. The castle was conquered by King Alphonse of Aragona who exploited a newly built bridge to capture it. Since then , this particular place is named Ischia Ponte, the Italian name for bridge. This pristine and charming place, not too distant from the Saint Anne reefs, is a preferred diving site where in water depth no more than ten meters the ruins of Aenaria , a pre- roman hamlet destroyed by a volcanic eruption on 130 B.C., can be inspected. Navigating anti-clockwise. the nearest landing is at Cassamicciola, a place renown since the Middle Age for its healing waters. There is room at this port for 100 boats with LOA up to 60 meters; there is however a draught limitation of 2.5 meters at the dock and a shallow water patch with water depth of about 1 meter at the harbor center. Lacco Ameno and its patron saint, Santa Restituita, whose original building dates back to the year 1000, offers only a finger pier and whose head is used by ferries. There are two new docks but water depth here is between 3 and 1.2 meters as well. Thirty boats with maximum LOA of 15 meters can be moored here. Immediately around Soccorso point the port of Fiorio, with a small church and Mount Apium, 800 meters high, both overlooking it, can be easily reached. While a new port installation is being built, only forty boats not exceeding 40 meters LOA can be accepted her. 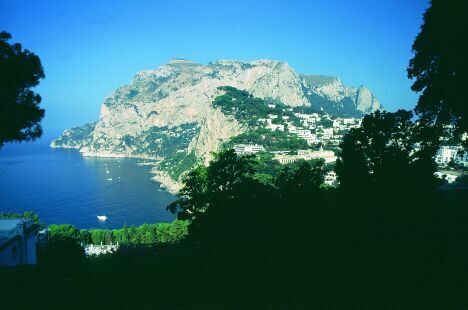 Sant' Angelo, sheltered by the homonymous cape and two cliffs, has one 50 meters long pier where about 50 boats with 50 meters maximum LOA can be taken.